Nonferrous slags are produced during the recovery and processing of nonferrous metal from natural ores. The slags are molten by-products of high temperature processes that are primarily used to separate the metal and nonmetal constituents contained in the bulk ore. When cooled, the molten slag converts to a rocklike or granular material. The processing of most ores involves a series of standardized steps. After mining, the bulk ore is processed to remove any gangue (excess waste rock and minerals). This processing typically consists of pulverizing the ore to a relatively fine state, followed by some form of gravity separation of the metals from the gangue (using a series of devices including cyclone separators, inclined vibratory tables, and flotation tanks). The refined ore is processed thermally to separate the metal and nonmetal constituents, then further reduced to the free metal. Since most of these metals are unsuitable for use in a pure state, they are subsequently combined with other elements and compounds to form alloys having the desired properties. In preparation for metal ion reduction (designed to separate the metal from the nonmetal constituents), some nonoxide minerals are often converted to oxides by heating at air temperatures below their melting point ("roasting"). Sulfide minerals, when present (in copper and nickel ore), are converted to oxides in this process. The reduction of the metal ion to the free metal is normally accomplished in a process referred to as smelting. In this process, a reducing agent, such as coke (impure carbon), along with carbon monoxide and hydrogen, is combined with the roasted product and melted in a siliceous flux. The metal is subsequently gravimetrically separated from the composite flux, leaving the residual slag. Copper and nickel slags are produced by: 1. roasting, in which sulfur in the ore is eliminated as sulfur dioxide (SO2); 2. smelting, in which the roasted product is melted in a siliceous flux and the metal is reduced; and 3. converting, where the melt is desulfurized with lime flux, iron ore, or a basic slag and then oxygen lanced to remove other impurities. Phosphorus slag is a by-product of the elemental phosphorus refining process. The elemental phosphorus is separated from the phosphate-bearing rock in an electric arc furnace, with silica and carbon added as flux materials to remove impurities during the slagging process. Iron, which is added to the furnace charge, combines with phosphorus to form ferrophosphorus which can be tapped off. The slag, which remains after removal of elemental phosphorus and/or ferrophosphorus, is also tapped off. Lead, lead-zinc, and zinc slags are produced during pyrometallurgical treatment of the sulfide ores. The process includes three operations similar to copper and nickel slag production: 1. roasting, 2. smelting, and 3. converting. Lead and zinc are often related as coproducts in both source and metallurgical treatments, and the various combinations of slags, which include lead, lead-zinc, and zinc, are similarly produced. Figure 1 presents a general schematic depicting the slag production process for copper, nickel, and lead-zinc slags. Figure 2 presents a similar diagram for phosphorus slag production. Figure 1. General process diagram for copper, nickel and lead-zinc slag production. Figure 2. General process diagram for phosphorous slag production. Nonferrous slags are produced in a few locations, often remote from potential markets. As a result, nonferrous slags are not well utilized and most of the nonferrous slag produced is disposed of in slag dumps or stockpiles. Nonferrous slags, when they are used, are marketed directly by the producers. Slag generation is highly dependent on specific processes and sources; consequently, slag properties can vary between plants and different ore sources, and must be investigated on a case-by-case basis. Most of the molten nonferrous slag that is produced is dumped into a pit and simply allowed to air cool, solidifying under ambient conditions. A small proportion is granulated, using rapid water and air quenching that results in the production of a vitrified fritlike product. Phosphorus slag is sometimes expanded (solidified with controlled quantities of water, air, or steam, which accelerate the process and increase the cellular nature of the slag), producing a lightweight product. The cooling rate has a strong influence on the mineralogy and, consequently, the physical and cementitious properties of the nonferrous slags. Granulated slags, which are produced by rapid quenching of the molten slag, are more vitreous and more reactive than similar air-cooled slags. Granulated slags solidify to relatively small, uniform particles whereas air-cooled slags solidify in a large mass. Because they are produced in remote geographic locations, nonferrous slags are not commonly used in highway construction applications. Nonetheless, there have been reported uses of nonferrous slag as an aggregate substitute in hot mix asphalt and granular base applications. Processing of nonferrous air-cooled slags for use as aggregate involves conventional crushing and screening to meet the specified gradation requirements. Granulated slag particles are generally of fine aggregate size and may require blending with other suitable material to satisfy specified gradation requirements. Granulated copper and nickel slags can be expected to exhibit some cementitious properties similar to granulated phosphorus slags; however, there is no documented use of these slags in this (cementing) capacity. Table 1 lists some typical physical properties for nonferrous slags. Because they have similar properties, lead, lead-zinc, and zinc slags are grouped together. Table 1. Typical physical properties of nonferrous slags. Air-cooled nickel slag is brownish-black in color. It crushes to angular particles but has a smooth, glassy texture. The specific gravity of air-cooled nickel slag may be as high as 3.5(15), while the absorption is quite low (0.37 percent). (3) The unit weight of nickel slag is somewhat higher than that of conventional aggregate. Granulated nickel slag is essentially an angular, black, glassy slag "sand" with most particles in the size range of minus 2 mm (No. 10 sieve) to plus 0.150 mm (No. 100 sieve). (15) It is more porous, with lower specific gravity and higher absorption, than air-cooled nickel slag. Granulated copper slag is more porous and therefore has lower specific gravity and higher absorption than air-cooled copper slag. The granulated copper slag is made up of regularly shaped, angular particles, mostly between 4.75 mm (3/4 in) and 0.075 mm (No. 200 sieve) in size. Air-cooled phosphorus slag tends to be black to dark gray, vitreous (glassy), and of irregular shape. Individual particles are generally flat and elongated, with sharp fracture faces similar to broken glass. The crushed material has a unit weight of 1360 to 1440 kg/m3 (85 to 90 lb/ft3),(1)13 which is less than that of conventional aggregate, with absorption values of about 1.0 to 1.5 percent. (10) Expanded phosphorus slag has a unit weight of 880 to 1000 kg/m3 (55 to 62 lb/ft3)(13) and has a higher absorption than air-cooled slag due to its more vesicular nature. Granulated phosphorus slag is made up of regularly shaped, angular particles, mostly between 4.75 mm (1/4 inch) and 0.075 mm (No. 200 sieve) in size. It is more porous than air-cooled slag and consequently has lower specific gravity and higher absorption. Slags of this group are often black to red in color and glassy. They have sharp, angular particles that are cubical in shape. The unit weights of lead, lead-zinc, and zinc slags are somewhat higher than conventional aggregate materials. Granulated lead, lead-zinc, and zinc slags tend to be porous, with up to 5 percent absorption. (16) The specific gravity can vary from less than 2.5(16)to as high as 3.6. (15) These slags are made up of regularly shaped, angular particles, mostly between 4.75 mm (3/4 in) and 0.075 mm (No. 200 sieve) in size. Copper, lead, lead-zinc, and zinc slags are essentially ferrous silicates, while phosphorus slag and nickel slag are primarily calcium/magnesium silicates. Table 2 list typical chemical compositions of these slags. During slag production, the sudden cooling that results in the vitrification of nonferrous slags (typically in the granulating process) prevents the molecules from being locked up in crystals. In the presence of an activator (such as calcium hydroxide from hydrating Portland cement) vitrified nonferrous slags react with water to form stable, cementitious, hydrated calcium silicates. The reactivity depends on the fineness to which the slag is ground (reactivity increases with fineness)(4) and the chemical composition of the slag and its glass content. These vitrified slags can be of such composition that when ground to proper fineness, they may also react directly with water to form hydration products that provide the slag with cementitious properties. A high iron content (essentially ferrous silicate slags) in these slags appears to limit hydraulicity and makes grinding difficult. Hydratable oxides may also be present in some nonferrous slags from some sources, which could potentially contribute to volumetric instability. Table 3 presents typical mechanical properties for nonferrous slags. Processed air-cooled and granulated copper, nickel, and phosphorus slags have a number of favorable mechanical properties for aggregate use, including excellent soundness characteristics, good abrasion resistance, and good stability (high friction angle due to sharp, angular shape). However, nonferrous slags tend to be vitreous, or "glassy," which adversely affects their frictional properties (skid resistance), a potential problem if used in pavement surfaces. Table 3. Typical mechanical properties of nonferrous slags. Collins, R. J. and S. K. Ciesielski. Recycling and Use of Waste Materials and Byproducts in Highway Construction, National Cooperative Highway Research Program Synthesis of Highway Practice No. 199, Transportation Research Board, Washington, DC, 1994. Emery, J. J., "Dominican Republic Mega Project Uses Hi-Tech Hot Mix," Ontario Hot Mix Producers Association, (OHMPA), Asphaltopics, Volume 8, Issue 2, July 1995. Ontario Ministry of Natural Resources. Mineral Aggregate Conservation Reuse and Recycling. Report prepared by John Emery Geotechnical Engineering Limited (JEGEL) for Aggregate and Petroleum Resources Section, Ontario Ministry of Natural Resources, Ontario, 1992. Tennessee Department of Transportation. Test Reports on Samples of Coarse and Fine Aggregates, Provided to JEGEL, July, 1995. Hughes, M.L. and T.A. Halliburton, "Use of Zinc Smelter Waste as Highway Construction Material," Highway Research Record No. 430, 1973, pp. 16-25. Gutt, W., P. J. Nixon, M. A. Smith, W. H. Harrison and A. D. Russell. A Survey of the Locations, Disposal and Prospective Uses of the Major Industrial Byproducts and Waste Materials. CP 19/74, Building Research Establishment, Watford, U.K., 1974. Miller, R. H. and R. J. Collins. Waste Materials as Potential Replacements for Highway Aggregates. National Cooperative Highway Research Program Report 166, Transportation Research Board, Washington, DC, 1976. Wrong, G. A., Experiences with Inco Slag for Highway Construction Purposes. Ontario Department of Highways Report, January, 1960. Queneau, P. B., L. D. May, and D. E. Cregar, "Application of Slag Technology to Recycling of Solid Wastes." Incineration Conference, Knoxville, Tennessee, May, 1991. Feasby, D.G. Mineral Wastes as Railroad Ballast. Canada Centre for Mineral and Energy Technology, National Mineral Research Program, Mineral Sciences Laboratories Report MRP/MSL 75-76 (OP), Ottawa, Canada, 1975. Das, B. M., A. J. Tarquin, and A. Q. Jones. "Geotechnical Properties of Copper Slag," Transportation Research Record No. 941, National Research Board, Washington, DC, 1993. Gallup, G. H., White Pine Copper Company’s Reverberatory Furnace Slag for Highway Aggregates. Michigan Department of State Highways and Transportation, Testing and Research Division, October, 1974, p. 25. Emery, J. J., "Slag Utilization in Pavement Construction," Extending Aggregate Resources, ASTM Special Technical Publication 774, American Society for Testing and Materials, 1982, pp. 95-118. OECD. Use of Waste Materials and By-Products in Road Construction. Organization for Economic Co-operation and Development, Paris, 1977. JEGEL. Manitoba Slags, Deposits, Characterization, Modifications, Potential Utilization. Report prepared by John Emery Geotechnical Engineering Limited, Toronto, Ontario, 1986. Mantell, C. L. Solid Wastes: Origin, Collection, Processing and Disposal. John Wiley & Sons, New York, 1975. Hughes, M.L. and T.A. Haliburton, "Use of Zinc Smelter Waste as Highway Construction Material," Highway Research Record No.430, 1973, pp.16-25. Petty, F., Tennessee Department of Transportation, personal communication, July 1995. Mag, A. and J. J. Boyle. Assessment of Ra226 and Toxic Element Distribution at Tennessee Valley Authority Phosphate Slag Stockpiles, Muscle Shoals, AL. Report of Investigations/1990 RI 9288, United States Bureau of Mines, Washington, DC, 1990. Nonferrous slags tend to be produced in few, generally remote geographic locations situated some distance from potential urban asphalt paving markets. As a result, nonferrous slags are not well utilized. Phosphorus slag aggregates have been used in dense graded hot mix surface course mixes for asphalt concrete pavements in Tennessee, particularly where high wet skid resistance was desired. Some use of air-cooled phosphorus slag aggregate in hot mix asphalt has also occurred in Montana (as fine aggregate) and in Tennessee and Florida. The use of phosphorus slag is addressed within conventional materials specifications in Tennessee and Florida for both coarse and fine hot mix asphalt aggregates. Air-cooled nonferrous slags to be used as aggregate in asphalt must be crushed and screened to the desired gradation (coarse or fine aggregate). This can be undertaken using conventional aggregate processing plant equipment. Because granulated nonferrous slags tend to be uniform in size, they may require blending with other suitable materials to satisfy aggregate gradation requirements for asphalt mixtures. Some of the properties of nonferrous slags that are of particular interest when nonferrous slags are used as an aggregate in asphalt paving applications include particle shape and texture, gradation, unit weight, absorption, stability characteristics, wear resistance, frictional properties, adhesion, and resistance to freezing and thawing. Specific physical, chemical, and mineralogical properties of nonferrous slags depend in great part on the type of slag, method of production, type of furnace, and cooling procedures associated with their respective production processes. Consequently, each nonferrous slag aggregate must be considered by mineralogical type on a source-specific and cooling (air-cooled or granulated) basis. Shape and Texture: Air-cooled phosphorus slag aggregates are black to dark gray in color and are generally flat and elongated. Individual particles tend to be vitreous (glassy) with sharp fracture faces similar to broken glass (irregular shape). Granulated phosphorus slag is made up of regularly shaped, angular particles. Gradation: Air-cooled phosphorus slag can be processed into coarse or fine aggregate for hot mix asphalt to satisfy ASTM D692(10) and AASHTO M29(11) requirements. Granulated phosphorus slag can be used (after blending with other suitable material to satisfy AASHTO M29 gradation requirements) as a fine aggregate material. Unit Weight: Crushed air-cooled phosphorus slag has a unit weight ranging from 1360 to 1440 kg/m3 (85 to 90 lb/ft3). Expanded phosphorus slag has unit weight of 880 to 1000 kg/m3 (55 to 62 lb/ft3). (12) Granulated phosphorus slag is more vesicular than air-cooled slag and consequently has lower unit weight. Absorption: The absorption of air-cooled phosphorus slag is about 1.0 to 1.5 percent. (13) Both expanded and granulated phosphorus slags have higher absorption than air-cooled slag due to their more vesicular nature. Stability Characteristics: No data on stability characteristics of phosphorus slag were identified, but processing and blending with other suitable material should be capable of yielding a stable material. Wear Resistance: The high abrasion resistance of phosphorus slag can be expected to correspond to good wear resistance. Adhesion: Good adhesion to asphalt cement is facilitated by the moderate absorption (1.0 to 1.5 percent) of air-cooled phosphorus slag aggregates. Shape and Texture: Air-cooled copper slag aggregates are black in color, and typically have a glassy appearance. Granulated copper slag aggregates are similar to air-cooled copper slag aggregates but more vesicular. Gradation: Reverberatory copper slag can be processed into coarse or fine aggregate material for use in hot mix asphalt. It should be crushed and screened to produce aggregate that satisfies the gradation requirements for hot mix asphalt including ASTM D692(10) and AASHTO M29. (11)Granulated copper slag can be blended with other suitable material (to satisfy gradation requirements for AASHTO M29) as a fine aggregate for asphalt mixtures. Unit Weight: Crushed air-cooled copper slag has a unit weight of 2800 to 3800 kg/m(3) (175 to 237 lb/ft(3)). (14) The unit weight is somewhat higher than for conventional aggregates, resulting in increased density asphalt concrete (lower yield). Granulated copper slag is more vesicular and therefore has a lower unit weight than air-cooled slag. Absorption: Air-cooled copper slag absorption is typically very low (0.13 percent). (15) Granulated copper slag has a higher absorption than air-cooled slag. Frictional Properties: No specific data were identified. Adhesion: No specific data were identified, but low absorption values and the glassy nature of copper slag suggest that stripping might be a concern. Shape and Texture: Air-cooled nickel slag aggregates are reddish brown to brown-black in color. It can be crushed to angular particles but has a massive, angular, smooth, amorphous texture. Granulated nickel slag is essentially an angular, black, glassy slag "sand." Gradation: No specific data were identified, but no problems are anticipated in producing the appropriate gradation. Unit Weight: The unit weight of crushed air-cooled nickel slag tends to be as high as 3500 kg/m(3) (219 lb/ft(3) ). (18) Granulated nickel slag is more vesicular and has a lower unit weight than air-cooled nickel slag. Absorption: Air-cooled nickel slag has quite low absorption (0.37 percent). (18) Granulated nickel slag is more vesicular, and has higher absorption than air-cooled nickel slag. Stability Characteristics: The high angularity and friction angle (approximately 40°)(16) of nickel slag aggregates contribute to excellent stability and load bearing capacity. Wear Resistance: No data were identified, but the high hardness and good soundness properties suggest favorable wear resistance. Frictional Properties: No data were identified, but the high angularity and potential wear resistance could be expected to result in favorable frictional properties. Adhesion: No specific data were identified. Shape and Texture: Lead, lead-zinc, and zinc slags are black to red in color and have glassy, sharp, angular (cubical) particles. Gradation: No specific data were identified. Stability Characteristics: Although no specific data were identified, it is anticipated that these slags would produce acceptable stability characteristics. Wear Resistance: Although no specific data were identified, it is anticipated that these slags would produce acceptable wear resistance characteristics. Frictional Properties: Although no specific data were identified, it is anticipated that these slags would produce acceptable frictional properties. Adhesion: Although no specific data were identified, it is anticipated that these slags would produce acceptable adhesion characteristics. Soundness: Although no specific data were identified, it is anticipated that these slags would exhibit adequate soundness properties. Conventional asphalt mix design methods (e.g., Marshall, Hveem, SHRP) are applicable for the design of hot mix asphalt containing nonferrous slag (particularly air-cooled phosphorus and reverberatory copper slag) aggregates. No special procedures are required for aggregate gradations. Both coarse and fine nonferrous slag aggregates can be incorporated in hot mix asphalt, provided that the physical requirements of ASTM D692(10)and/or AASHTO M29(11) are satisfied. No special provisions are required for nonferrous slag, and conventional hot mix gradations specifications may be used. Blending with other suitable hot mix asphalt aggregates may be necessary to achieve gradation specifications compliance. Due to the difference in unit weights, mix designs are usually calculated on a volumetric basis. Some glassy nonferrous slags may be susceptible to moisture-related damage (stripping) and therefore, the mix design should include a stripping resistance or retained stability test (AASHTO T283(19) and MTO LS-283(20) ) and the addition of hydrated lime or other anti-stripping agents may be warranted. Due to their glassy nature, some air-cooled nonferrous slags may exhibit poor frictional properties. Conventional AASHTO pavement structure design methods are appropriate for asphalt paving incorporating nonferrous slag aggregates. The same production methods and equipment used for conventional hot mix asphalt can be used for production of hot mix asphalt containing nonferrous slag. The same equipment and construction procedures used for conventional hot mix asphalt aggregate can be used for hot mix asphalt paving mixtures incorporating nonferrous slag aggregates. Standard and field and laboratory tests for compacted bituminous mixes are given by AASHTO T168,(21) T166,(22) and ASTM D2950. (23) ASTM D4792(24) should be considered for nonferrous slags where significant quantities of hydratable oxides may be present. There is a need to investigate the poor frictional resistance properties associated with the use of air-cooled nickel slag and lead-zinc, slags which limit their use as aggregates in asphalt pavements. Particular attention is required to avoid using glassy aggregates as they impart poor frictional resistance properties to asphalt concrete pavements. Also, there is a need to investigate the potential use of nonferrous slag in surface treatments and cold mixes. Very little documentation data are available regarding their use in this application. Finally, there is little documentation regarding the engineering properties and performance/ serviceability of lead, lead-zinc, and zinc slags. 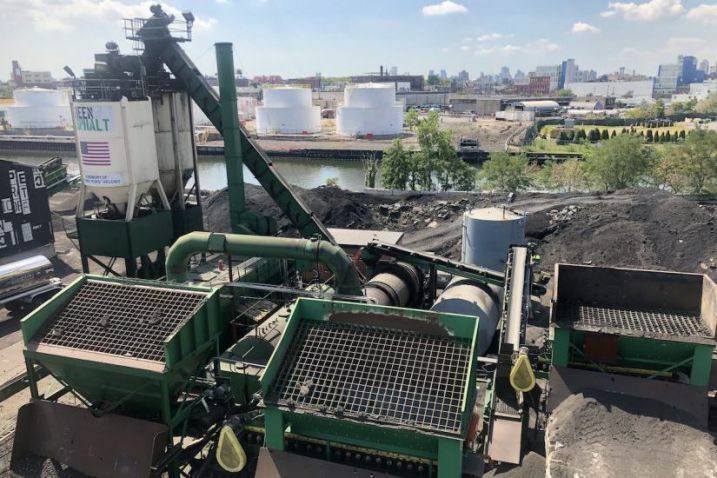 Environmental research, including chemical and leaching analyses and environmental assessments, is required to evaluate potential environmental issues associated with the use of these slag materials in asphalt paving applications. Burchett, J. L. and R. L. Rizenbergs. "Frictional Performance of Pavements and Estimates of Accident Probability," Pavement Surface Characteristics and Materials, ASTM Special Technical Publication 763, American Society for Testing and Materials, 1982, pp. 73-97. Dahir, S. H. and J. J. Henry. Alternatives for the Optimization of Aggregate and Pavement Properties Related to Friction and Wear Resistance. Federal Highway Administration Report, FHWA-RD-78-209, U.S. Department of Transportation, Washington, DC, 1978. Collins, R. J. and S. K. Cielieski. Recycling and Use of Waste Materials and By-Products in Highway Construction. National Cooperative Highway Research Program Synthesis of Highway Practice 199, Transportation Research Board, Washington, 1994. Rogers, C., Ontario Ministry of Transportation, Personal Communication, July 1995. "Nickel Slag Pavement," Product Literature Provided by Taisei Road Construction Co. Ltd., Tokyo, Japan. Emery, J. J. "Dominican Republic Mega Project Uses Hi-Tech Hot Mix," Ontario Hot Mix Producers Association (OHMPA), Asphaltopics, Volume 8, Issue 2, July 1995. Hughes, M. L. and T. A. Halliburton, "Use of Zinc Smelter Waste as Highway Construction Material," Highway Research Record No. 430, 1973, pp. 16-25. Gutt, W., P. J. Nixon, M. A. Smith, W. H. Harrison, and A. D. Russell. A Survey of the Locations, Disposal and Prospective Uses of the Major Industrial Byproducts and Waste Materials. CP 19/74, Building Research Establishment, Watford, U.K., 1974. Mantell, C.L. Solid Wastes: Origin, Collection, Processing and Disposal. John Wiley & Sons, New York, 1975. Das, B. M., A. J. Tarquin, and A. D. Jones, "Geotechnical Properties of Copper Slag," Transportation Research Record No. 941, Transportation Research Board, Washington, DC, 1993. Georgia Department of Transportation, information provided by the Office of Materials and Research, 1991. Emery, J. J., "Slag Utilization in Pavement Construction," Extending Aggregate Resources, ASTM Special Technical Publication 774, American Society for Testing and Materials, pp. 95-118, 1982. Ontario Ministry of Transportation. Resistance to Stripping of Asphaltic Cement in Bituminous Mixture by Immersion Marshall - LS 283, Laboratory Testing Manual, Ontario Ministry of Transportation, 1995. American Association of State Highway and Transportation Officials. Standard Method of Test, "Sampling Bituminous Paving Mixtures," AASHTO Designation: T 168-82, Part II Tests, 14th Edition, 1986. American Association of State Highway and Transportation Officials. Standard Method of Test, "Bulk Specific Gravity of Compacted Bituminous Mixtures Using Saturated Surface-Dry Specimens," AASHTO Designation: T 166-83, Part II Tests, 14th Edition, 1986. American Society for Testing and Materials. Standard Specification D 2950-91, "Density of Bituminous Concrete in Place by Nuclear Methods,"Annual Book of ASTM Standards, Volume 04.03, ASTM, West Coshohoken, Pennsylvania, 1996. American Society for Testing and Materials. Standard Specification D 4792-95, "Potential Expansion of Aggregates from Hydration Reactions,"Annual Book of ASTM Standards, Volume 04.03, ASTM, West Coshohoken, Pennsylvania, 1996. The use of copper, nickel and phosphorus slag aggregates as granular base has occurred primarily in rural areas close to the remote locations where these slags are produced. No North American use of lead or zinc slags as granular base has been confirmed. The unit weights of copper and nickel slags tend to be greater than those of conventional aggregates, with a corresponding lower yield and increased transportation and placement costs. The lower unit weight of phosphorus slag aggregates compared to conventional aggregates results in somewhat higher yield (greater volume for the same weight). Copper, nickel and phosphorus slags must be crushed and screened to produce a granular base aggregate. This can readily be accomplished using conventional crushing and screening plant and equipment. Crushing of air-cooled nickel slag produces a low quantity of finer particles, and consequently blending with additional crushed fine material may be necessary to satisfy gradation requirements. (1,5) Other nonferrous slag aggregates may also require blending with conventional granular aggregates to optimize aggregate properties. Crushed fines, having high angularity, should be used (rather than natural sand) to "lock-up" the smooth, hard nickel slag aggregates. Some of the engineering properties of nonferrous slag aggregates that are of particular interest when nonferrous slags are used in granular base applications include gradation, specific gravity, durability, stability, and drainage characteristics. Gradation: Copper slags can be crushed and screened to satisfy the AASHTO M147(9) gradation requirements for granular aggregates. Durability: Copper slag aggregates display very good soundness (resisting freeze-thaw deterioration), are harder than conventional granular aggregates and have good resistance to wear. Gradation: Nickel slags can be crushed and screened to satisfy the AASHTO M147(10) gradation requirements for granular aggregates. Drainage Characteristics: Nickel slag aggregates are free draining and non-frost susceptible. Gradation: Phosphorus slags can be crushed and screened to satisfy the AASHTO M147(11)gradation requirements for granular aggregates. Stability: Due to their sharp, angular shape, phosphorus slag aggregates demonstrate good stability. Drainage Characteristics: Phosphorus slag aggregates have good drainage characteristics. The high stability of properly graded, crushed, nonferrous slag aggregates provides good load transfer to a weaker subgrade. Due to the low fines generated by crushing nickel slags, it is often necessary to supplement nickel slag aggregates with suitable fine aggregate material. 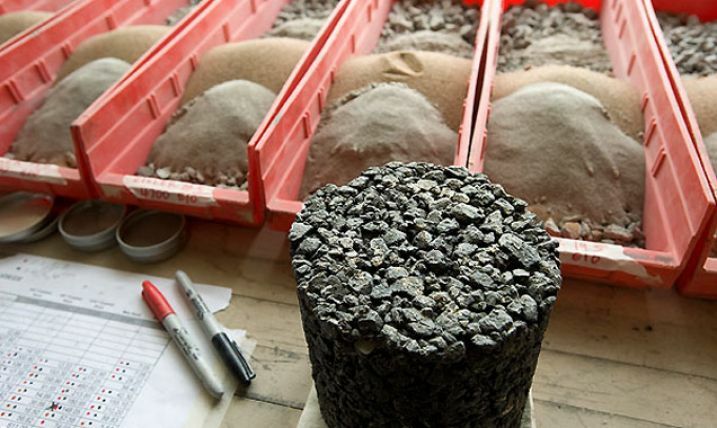 Standard AASHTO pavement structural design procedures can be employed for granular base containing nonferrous slag aggregates. The appropriate structural number for nonferrous slag aggregates should be established by resilient modulus testing. The same equipment and procedures used to stockpile and handle conventional aggregates can be used for nonferrous slag aggregates. Due to their high angularity, greater care should be taken when stockpiling and handling nonferrous aggregates to avoid segregation. Precautions may be required to ensure that nonferrous slag aggregate stockpiles are sufficiently separated from watercourses to prevent leachate contamination. The most pressing issue that needs to be resolved is the environmental suitability of nonferrous slags for granular base applications. Materials from each source must be assessed for heavy metals content and leachability. Phosphorus slag radioactivity concerns should also be investigated. Further, there is a need to establish standard methods and clear guidelines to assess the suitability of nonferrous slags that may be in contact with groundwater or watercourses. Emery, J.J., "Slag Utilization in Pavement Construction," Extending Aggregate Resources, ASTM STP774, American Society for Testing and Materials, 1982, pp. 95-118. Miller, R.H. and R.J. Collins, "Waste Materials as Potential Replacements for Highway Aggregates," Report 166, National Cooperative Highway Research Program, Transportation Research Board, Washington, D.C., 1976. Das, B.M., A.J. Tarquin, and A.Q. Jones, "Geotechnical Properties of a Copper Slag," Transportation Research Record 941, National Research Board, Washington, D.C., 1993. Feasby, D.G., "Mineral Wastes as Railroad Ballast," Canada Centre for Mineral and Energy Technology, National Mineral Research Program, Mineral Sciences Laboratories Report MRP/MSL 75-76 (op), Ottawa, Canada, 1975. Wrong, G.A., "Experiences with Inco Slag for Highway Construction Purposes," Ontario Department of Highways Report, January 1960. State of Tennessee Department of Transportation, Test Reports on Samples of Coarse and Fine Aggregates, provided to JEGEL, July 1995. Mag, A. and J.J. Boyle, "Assessment of Ra226 and Toxic Element Distribution at Tennessee Valley Authority Phosphate Slag Stockpiles, Muscle Shoals, AL.," Report of Investigations/1990 RI 9288, United States Department of the Interior, Bureau of Mines, Washington, D.C., 1990. Queneau, P.B., L.D. May, and D.E. Cregar, "Application of Slag Technology to Recycling of Solid Wastes," Incineration Conference, Knoxville, TN, May 1991. American Association of State Highway and Transportation Officials, Standard Specification for Materials, "Aggregate and Soil-Aggregate Subbase, Base and Surface Courses," AASHTO Designation: M147-70 (1980), Part I Specifications, 14th Edition, 1986. Mantell, C.L., "Solid Wastes: Origin, Collection, Processing and Disposal,"John Wiley, New York, 1975. American Society for Testing and Materials, Standard Specification D2940-92, "Graded Aggregate Material for Bases and Subbases for Highways or Airports," ASTM Book of Standards, Section 4, West Conshohocken, Pennsylvania, 1996. American Association of State Highway and Transportation Officials, Standard Method of Test, "Density of Soil In-Place by the Sand Cone Method," AASHTO Designation: T191-86, Part II Tests, 14th Edition, 1986. American Association of State Highway and Transportation Officials, Standard Method of Test, "Density of Soil In-Place by the Rubber-Balloon Method," AASHTO Designation: T205-86, Part II Tests, 14th Edition, 1986. American Association of State Highway and Transportation Officials, Standard Method of Test, "Moisture Content of Soil and Soil Aggregate in Place by Nuclear Methods (Shallow Depth)," AASHTO Designation: T239-86, Part II Tests, 14th Edition, 1986. Although there is little documented use of nonferrous slags as aggregate in embankments or fill, both air-cooled and granulated nonferrous slags are potentially useful for these applications. Nonferrous slag that is suitable for use as a granular base (copper, nickel, and phosphorus slags) will generally exceed specifications for embankment and fill construction. The high stability of nonferrous slag aggregates can be used advantageously to provide good load transfer to weaker subgrades. Some of the desirable features of nonferrous slags for embankment construction include their high stability, good drainage characteristics, and negligible plasticity. Slags from the production of copper, nickel, lead and zinc have higher unit weight, resulting in lower yield and potentially increased long-term settlement if placed over compressible soils. While limited toxicity testing data indicate that the leachate from specific copper and phosphorus slags are not hazardous(1,2) (as measured by EPA hazardous waste testing procedures), nonferrous slags produced from sulfide ores may contain leachable sulfur. If placed in poor drainage conditions and in extended contact with stagnant or slow-moving water, sulfur odor and water discoloration may result. Copper slag (air-cooled and granulated) suitable for use as granular road base material has suitable engineering properties for use in embankments or fill applications. (3) Reverberatory copper slag (copper slag derived from reverberatory furnaces used for the smelting of copper concentrates)(4,5)is covered by conventional specifications for granular aggregate in Michigan. Nickel slag (air-cooled and granulated) suitable for use as granular road base material has suitable engineering properties for use in embankment or fill applications. (6) Nickel slag is considered as a conventional granular aggregate and railway ballast in Ontario, Canada. Due to galvanic corrosion concerns, steel pipelines, services and piles should be separated from nickel slag (for instance, using a 150 mm (6 in) thick layer of natural aggregate material). Phosphorus slag has suitable engineering properties for use in embankment or fill applications, and large quantities of phosphorus slag have been used in Montana for aggregate in base courses. (6) The low unit weight of phosphorus slag aggregates results in higher yield (greater volume for the same weight), reduced dead load (leading to reduced long-term settlement of compressible soils), and reduced lateral pressures compared with conventional fill materials. Other than crushing of large, air-cooled pieces, nonferrous slags require minimal processing to satisfy the physical requirements for use in embankments. If necessary, the nonferrous slag aggregates can be blended with conventional embankment or fill materials (rock, soil, aggregates) to meet required gradation specifications. Some of the engineering properties of nonferrous slags that are of particular interest when nonferrous slags are used in embankment or fill applications include gradation, unit weight, absorption, soundness, stability, drainage, and corrosivity. Unit Weight: Copper slag has a unit weight of 2800 to 3800 kg/m3 (175 to 237 lb/ft3). (8) The unit weight is somewhat higher than for conventional aggregates, resulting in increased density asphalt concrete (lower yield). Absorption: Air-cooled copper slag absorption is typically very low (0.13 percent). (9) Granulated copper slag has a higher absorption than air-cooled slag. Stability: The high angularity and friction angle (up to 53 )(3) of copper slag aggregates contribute to excellent stability and load bearing capacity. Corrosivity: No data were identified to permit an evaluation of the potential corrosivity of copper slag. Gradation: No specific data were identified for this application; however, no problems are anticipated in meeting the appropriate gradation requirements. Unit Weight: The unit weight of crushed air-cooled nickel slag tends to be as high as 3500 kg/m3 (219 lb/ft3). (5) Granulated nickel slag is more vesicular, and has lower unit weight than air-cooled nickel slag. Absorption: Air-cooled nickel slag has quite low absorption (0.37 percent). (5) Granulated nickel slag is more vesicular and has higher absorption than air-cooled nickel slag. Stability: The high angularity and friction angle (approximately 40 )(3) of nickel slag aggregates contribute to excellent stability and load bearing capacity. Corrosivity: There is some evidence that nickel slag can contribute to the corrosion of ferrous metals in the presence of moisture, probably due to galvanic effects (differences in electrochemical potential between the nickel slag and iron or steel). Gradation: Air-cooled phosphorus slag can readily satisfy the AASHTO M145(11) gradation and physical requirements for embankment aggregates. Unit Weight: The unit weight of crushed air-cooled phosphorus slag ranges from 1360 to 1440 kg/m3 (85 to 90 lb/ft3). The unit weight of expanded phosphorus slag is about 880 to 1000 kg/m3 (55 to 62 lb/ft3). (12) Granulated phosphorus slag is more vesicular than air-cooled slag and consequently has lower unit weight. Stability: No data were available regarding the stability characteristics of phosphorus slag; however, a properly graded material should be capable of yielding a stable fill. Structural design procedures employed for embankments containing nonferrous slag are the same as design procedures for conventional embankment materials. There are no standard specifications covering nonferrous slag use as embankment or fill. The designer may be required to satisfy moisture content criteria according to AASHTO T99(14) and implement appropriate material handling practices to avoid segregation and breakage. The same methods and equipment used to store or stockpile conventional aggregates are applicable for nonferrous slag. Precautions may be required to ensure that stockpiles containing nonferrous slag materials are sufficiently separated from watercourses to prevent leachate contamination. The material should be placed in a manner that allows free drainage and prevents ponding within or against the material. Due to their high angularity, additional effort (for instance, using vibratory rollers) may be required to compact copper, nickel, and phosphorus slags to their maximum densities. The main unresolved issue pertaining to the use of nonferrous slags in embankment construction is that of environmental suitability. The material for each application must be assessed for leachate toxicity. Phosphorus slag must also be assessed for potential radioactivity. Further, standard methods and clear guidelines to assess the suitability of nonferrous slags that may be in contact with groundwater or watercourses should be established. The potential corrosion risk to buried utilities within nickel as well as other nonferrous slag fills should be evaluated. Das, B. M., A. J. Tarquin, and A. D. Jones, "Geotechnical Properties of a Copper Slag," Transportation Research Record 941, Transportation Research Board, Washington, DC, 1993. Organization for Economic Cooperation and Development. Use of Waste Materials and Byproducts in Road Construction. OECD, Paris, 1977. Biswas, A. K. and A. K. Davenport. Extractive Metallurgy of Copper. Pergamon Press, Sydney, Australia, 1976. Roper, H., F. Kam, and G. J. Auld. "Characterization of a Copper Slag Used In Mine Fill Operations," Fly Ash, Silica Fume, and Other Mineral By-Products in Concrete, Volume 2. Special Publication 79, American Concrete Institute, Detroit, Michigan, 1983, pp. 1091-1109. Queneau, P. B., L. D. May, and D. E. Cregar, "Application of Slag Technology to Recycling of Solid Wastes," Incineration Conference, Knoxville, Tennessee, May, 1991. Feasby, D. G. Mineral Wastes as Railroad Ballast. Canada Centre for Mineral and Energy Technology, National Mineral Research Program, Mineral Sciences Laboratories Report MRP/MSL 75-76 (OP), Ottawa, Canada, 1975. American Association of State Highway and Transportation Officials. Standard Method of Test, " Density of Soil In-Place by the Sand Cone Method," AASHTO Designation: T 191-86, Part II Tests, 14th Edition, 1986. American Association of State Highway and Transportation Officials. Standard Method of Test, "Density of Soil In-Place by the Rubber-Balloon Method," AASHTO Designation: T 205-86, Part II Tests, 14th Edition, 1986. American Association of State Highway and Transportation Officials. Standard Method of Test, "Density of Soil and Soil-Aggregate in Place by Nuclear Methods (Shallow Depth)," AASHTO Designation: T 238-86, Part II Tests, 14th Edition, 1986.